September 27, 2010 - Southwest Airlines announced today that it has entered into a definitive agreement to acquire all of the outstanding common stock of AirTran Holdings, Inc., the parent company of AirTran Airways (AirTran), for a combination of cash and Southwest Airlines' common stock. At Southwest Airlines' closing stock price of $12.28 on September 24, 2010, the transaction values AirTran common stock at $7.69 per share, or approximately $1.4 billion in the aggregate, including AirTran's outstanding convertible notes. This represents a premium of 69 percent over the September 24, 2010 closing price of AirTran stock. Under the agreement, each share of AirTran common stock will be exchanged for $3.75 in cash and 0.321 shares of Southwest Airlines' common stock, subject to certain adjustments, based on Southwest Airlines' share price prior to closing. Including the existing AirTran net indebtedness and capitalized aircraft operating leases, the transaction value is approximately $3.4 billion. The agreement has been unanimously approved by the boards of directors of each company, and closing is subject to the approval of AirTran stockholders, receipt of certain regulatory clearances, and fulfillment of customary closing conditions. "Today is an exciting day for our Employees, our Customers, the communities we serve, and our Shareholders," said Gary C. Kelly, Chairman, President, and CEO of Southwest Airlines. "As we approach our 40th Anniversary of providing exceptional Customer Service at everyday low fares, the acquisition of AirTran represents a unique opportunity to grow Southwest Airlines' presence in key markets we don't yet serve and takes a significant step towards positioning us for future growth. "This acquisition creates more jobs and career opportunities for our combined Employee groups, as a whole. It allows us to better respond to the economic and competitive challenges of our industry, and fits perfectly within our strategy for our fifth decade of service. It offers Customers more low-fare destinations as we extend our network and diversify into new markets, including significant opportunities to and from Atlanta, the busiest airport in the U.S. and the largest domestic market we do not serve, as well as Washington, D.C. via Ronald Reagan National Airport. ?The acquisition also allows us to expand our presence in key markets, like New York LaGuardia, Boston Logan, and Baltimore/Washington. It presents us the opportunity to extend our service to many smaller domestic cities that we don't serve today, and provides access to key near-international leisure markets in the Caribbean and Mexico. Finally, this accelerates our goal to boost profits and achieve our financial targets." The acquisition will significantly expand Southwest Airlines' low-fare service to many more Customers in many more domestic markets, creating hundreds of additional low-fare itineraries for the traveling public. Moreover, the expansion of low fares should generate hundreds of millions in annual savings to consumers. Based on an economic analysis by Campbell-Hill Aviation Group, LLP*, Southwest Airlines' more expansive low-fare service at Atlanta, alone, has the potential to stimulate over two million new passengers and over $200 million in consumer savings, annually. These savings would be created from the new low-fare competition that Southwest Airlines would be able to provide as a result of the acquisition, expanding the well-known "Southwest Effect'" of reducing fares and stimulating new passenger traffic wherever it flies. "Both companies have dedicated people with kindred Warrior Spirits, who care about each other, and who care about serving Customers. We will continue to build upon our outstanding Customer experiences, strong and unique Cultures, and award-winning, safe operations," said Kelly. "We believe this acquisition can benefit all Stakeholders. Ultimately, we are very excited to spread low fares farther and look forward to working together with AirTran to realize the new opportunities and benefits we expect to derive from this combination." Bob Fornaro, AirTran Airways' Chairman, President and CEO said, "This agreement is great news for our Crew Members, our shareholders, our customers and the communities we serve. Joining Southwest Airlines will give us opportunities to grow, both professionally as individuals and as a group, in ways that simply would not be possible without this agreement. This agreement with Southwest is a testament to the success and hard work of the more than 8,000 AirTran Crew Members who have built this airline. I am tremendously proud of the things we have accomplished together and look forward to continuing that great work during this next exciting chapter of our history." Based on current operations, the combined organization would have nearly 43,000 Employees and serve more than 100 million Customers annually from more than 100 different airports in the U.S. and near-international destinations. In addition, the combined carriers' all-Boeing fleet consisting of 685 active aircraft would include 401 Boeing 737-700s, 173 Boeing 737-300s, 25 Boeing 737-500s, and 86 Boeing 717s, with an average age of approximately 10 years, one of the youngest fleets in the industry. Southwest Airlines also announced, previously, that it is evaluating the opportunity to introduce the Boeing 737-800 into its domestic network to complement its current fleet, providing opportunities for longer-haul flying and service to high-demand, slot-controlled, or gate-restricted markets. This acquisition supports Southwest Airlines' evaluation of the Boeing 737-800. 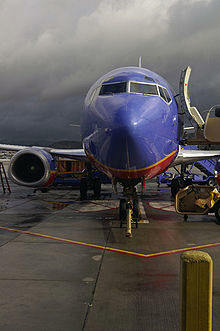 Until closing, Southwest Airlines and AirTran will continue to operate as independent companies. After closing, Bob Fornaro will continue to be involved in the integration of the two companies. Southwest Airlines plans to integrate AirTran into the Southwest Airlines Brand by transitioning the AirTran fleet to the Southwest Airlines livery, developing a consistent Customer Experience, and consolidating corporate functions into its Dallas headquarters. Subject to receipt of necessary approvals, Southwest Airlines' integration plans include transitioning the operations of the two carriers to a Single Operating Certificate. Plans for existing AirTran facilities will be developed by integration teams and decisions will be announced at appropriate times. The carriers' frequent-flyer programs will be combined over time, as well. Under the agreement, each share of AirTran common stock will be exchanged for $3.75 in cash and 0.321 shares of Southwest Airlines' common stock, subject to certain adjustments. The number of shares to be issued by Southwest Airlines is subject to adjustment if the average of Southwest Airlines closing prices for the 20 trading days ending three trading days prior to closing is below $10.90 or above $12.46. This adjustment mechanism is intended to provide at least $7.25 in value and up to $7.75 in value per share of AirTran common stock. If the average closing price noted above exceeds $12.46, the value will be $7.75 with fewer shares of Southwest common stock issued. If the average closing price noted above is less than $10.90, the value will be $7.25 with additional shares of Southwest common stock issued. Additionally, Southwest Airlines has the option of substituting cash in lieu of issuing incremental shares if the average closing stock price is less than $10.90. Assuming an exchange ratio of 0.321 and the conversion of AirTran's outstanding convertible notes, AirTran stockholders would receive approximately 57 million shares of Southwest Airlines common stock, which represents approximately seven percent of the pro forma Southwest Airlines common shares outstanding, as well as approximately $670 million in cash. The Teamsters Union announced that it is assembling an experienced team of experts to ensure its members? jobs and interests are protected should the proposed merger of Southwest Airlines and AirTran Airways be approved by federal regulators and shareholders. The Teamsters represent 430 mechanics and related workers at AirTran and 22 flight simulators and 165 stock clerks at Southwest. ?Our most important responsibility is to ensure that the proposed merger addresses the concerns of our membership,? said Teamsters Airline Division Director David Bourne. ?Our team of legal and financial experts has extensive experience with mergers and acquisitions and will watch this process carefully so that the interests of our mechanics, flight simulators and stock clerks members are protected. ?